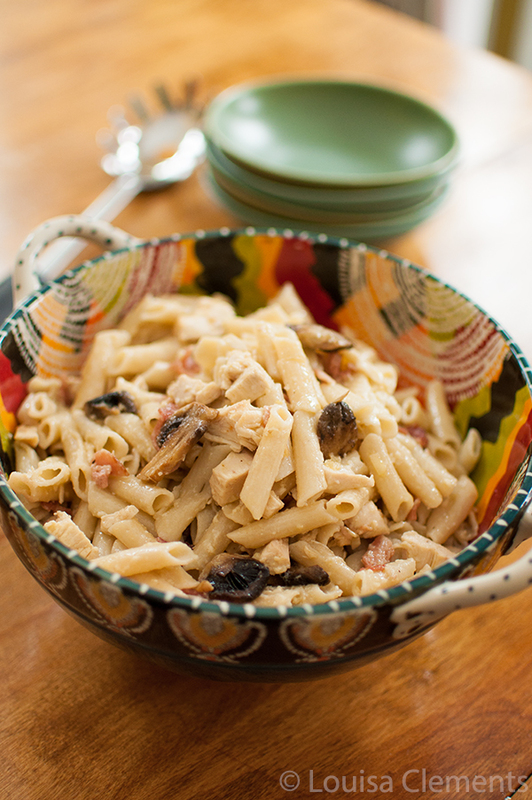 I bet you didn’t realize that you’ve been looking for this pasta with chicken mushroom and bacon recipe for your whole life, but you have. Trust me. It’s one of those life-saver, what-on-earth-are-we-going-to-have-for-dinner kind of recipes. It uses pantry and fridge staples, I pretty much always have some cooked chicken in my fridge and there is usually bacon in my freezer, and mushrooms, well those are just kind of a standard fridge item these days. Do you have mushrooms on hand? They are great for tossing into an omelette or adding to quinoa for a satisfying vegetarian lunch option. Or, you can always toss them with a little wine and some pasta and you’ve got yourself a meal (try my mushroom cream sauce recipe). When I serve a big, hearty bowl of pasta, I’m always sure to serve a healthy side salad to get some greens on the table. It’s march 2nd, eh? Time is flying. The Oscars are happening tonight, and I’m a little disappointed in myself because I was planning on throwing a little Oscars party like I have in years before, but I just couldn’t get my stuff together after my Team Canada party . School has just been ruling my life these days – it’s what always happens in February and March. I’m literally counting down the days until summer ­– a summer, which if goes according to plan, might be the best summer so far. I’m currently planning for five weeks of travels with my sister throughout Europe, we’re starting to think about our itinerary and places we’d like to visit, but there are so many. I really want to see the whole world one day. Back to the Oscars, I made it to 7/9 films this year, which is pretty good considering how much homework I’ve had and how I’ve really been focusing on creating content for Living Lou. I really thought I would make it to see them all this year, but time, as always slipped by, the way it seems to. I was on such a roll in December/January and then completely fell off the movie-going wagon come February. I think the weather in February mixed with an overwhelming amount of assignments just makes me never want to leave my house, even to go and sit in a cozy movie theater. Of the films I did see, they were phenomenal, Her was definitely the film that stuck with me the most. American Hustle and Wolf of Wallstreet were both really entertaining, but Her. Oh my. I can’t stop talking about it. It was one of those films that, for some reason, just made a huge impact on me. The melancholy feeling that carried throughout the film, the colour palette, the costumes, the ambiguous setting and time period. It’s interesting because, as you may or may not know, I study and work in film, and my Facebook feed was literally filled with film-types talking about how much they loved Her and then non-film-types hating on it. Kind of interesting the way that works. Did you see the film “Her”? What did you think? What movies are you rooting for this year? Well, enough about The Oscars – here’s the recipe you’ve all been waiting for. A simple, save-your-life weeknight dinner! Heat olive oil over in a large saute pan over medium heat. Add garlic, saute until fragrant, about 1-2 minutes. Add button mushrooms and cook for 5-7 minutes. Add white wine, and cook for 2-3 minutes. Stir in diced chicken, cooked bacon and parmesan cheese. 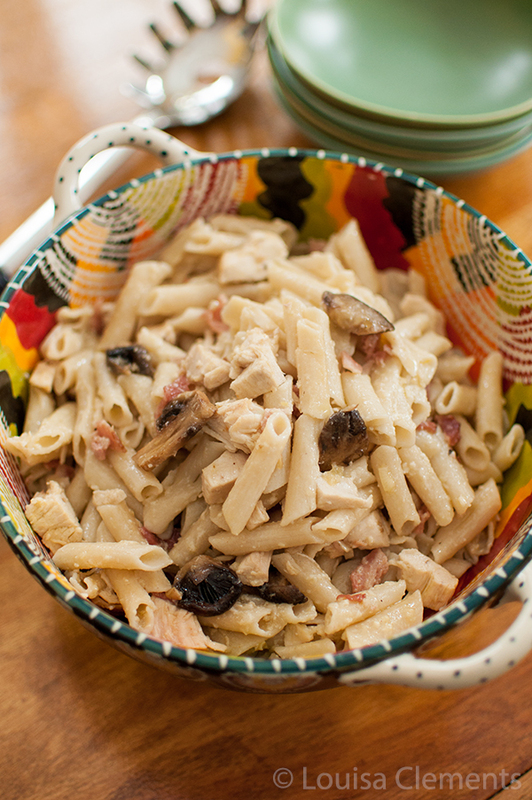 Enjoy the Oscars tonight, and be sure to add this pasta with chicken, mushrooms and bacon to your meal plan this week. That's so great you saw 7/9 Oscar films. I've always wanted to do that. I bet it makes watching the Oscars even more entertaining. I haven't seen Her, but I can't wait to. And this pasta sounds great! Thanks, Natalie! It definitely makes it more entertaining - this was such a great year for films! Chicken, bacon, AND mushrooms! YUM. Sounds like the perfect flavor popping dish to me! Pinned this bad boy! Beautiful pics too girl! I can just taste how delicious this pasta salad is. Absolutely going to pin this recipe and then make a batch to bring for lunch this week. Great ingredients in here but what is the pack size? Hi Fiori, sorry about that, the package size is 454g. Let me know if you try this recipe!